Bundaleer is an old, historic cliff situated up high in the Central Grampians. It provides some really stunning and atmospheric climbing. There are many good routes in the lower grades; lower than grade 20. Usually these climbs follow stunning lines and features which make for very memorable experiences. Bundaleer in those grades is predominately multi-pitch trad climbing. Be prepared to place your ‘wigglies’. In the terms of VCC Club Trips, you need to be an Intermediate Climber. Places for Intermediate Climbers will be limited. Dave Scarlett is the trip leader. The total participant numbers on this trip will be limited, so even if you are an Advanced Climber, contact Dave early to secure your place. 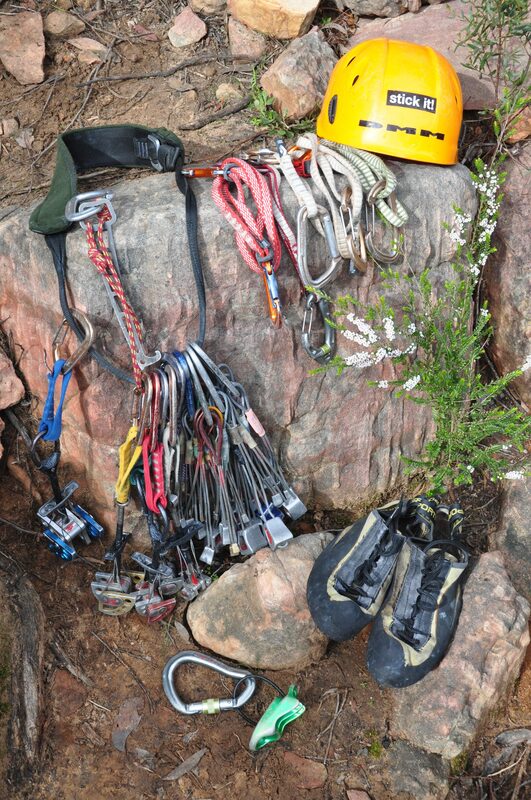 Photo: Trad rack and gear ready for Bundaleer.